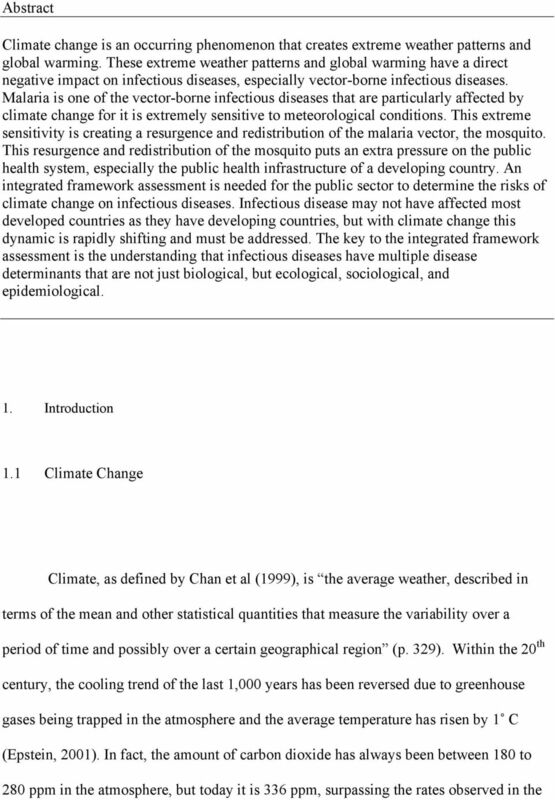 Download "The Impact of Climate Change on Vector-Borne Infectious Diseases. Namasha Schelling. 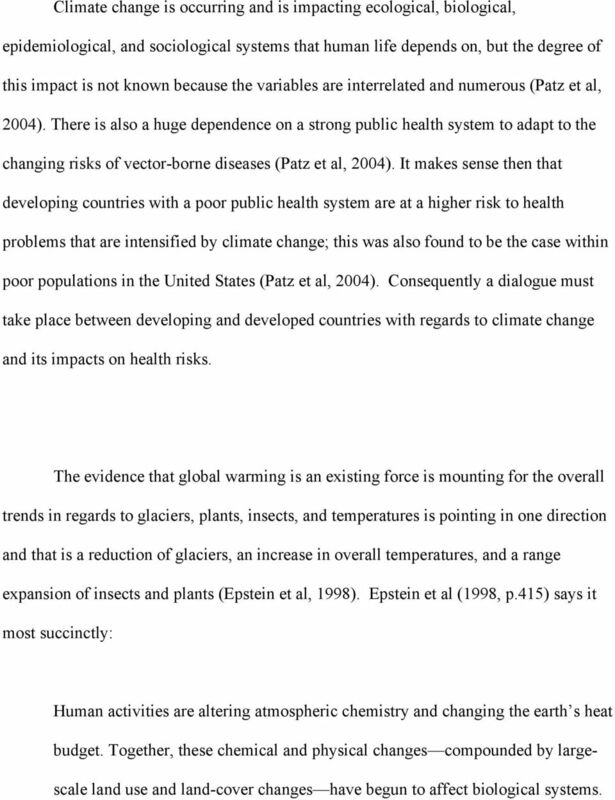 Graduate Research Paper"
6 ecological, sociological, and epidemiological processes (p. 329). And thus there is a multitude of ever changing disease determinants (Chan et al, 1999). 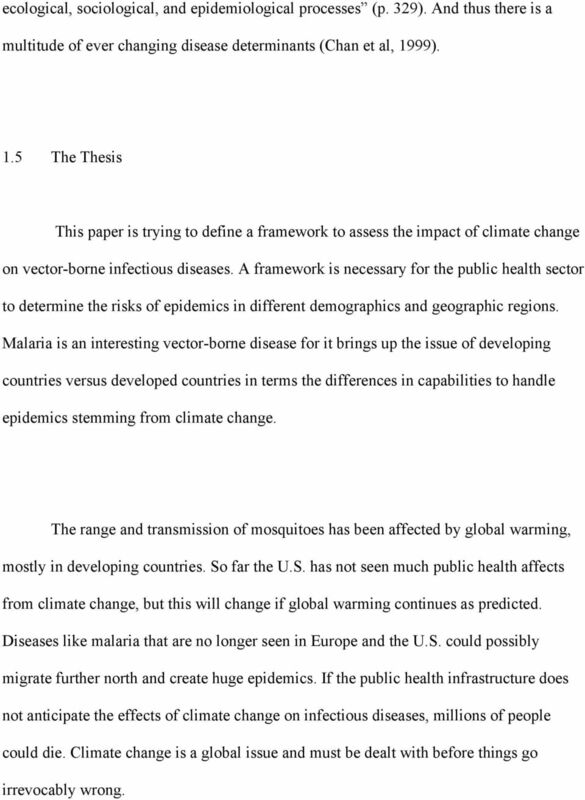 1.5 The Thesis This paper is trying to define a framework to assess the impact of climate change on vector-borne infectious diseases. A framework is necessary for the public health sector to determine the risks of epidemics in different demographics and geographic regions. Malaria is an interesting vector-borne disease for it brings up the issue of developing countries versus developed countries in terms the differences in capabilities to handle epidemics stemming from climate change. The range and transmission of mosquitoes has been affected by global warming, mostly in developing countries. So far the U.S. has not seen much public health affects from climate change, but this will change if global warming continues as predicted. Diseases like malaria that are no longer seen in Europe and the U.S. could possibly migrate further north and create huge epidemics. If the public health infrastructure does not anticipate the effects of climate change on infectious diseases, millions of people could die. Climate change is a global issue and must be dealt with before things go irrevocably wrong. 8 insects, and insect-borne diseases are migrating to higher elevations (Epstein, 2001). 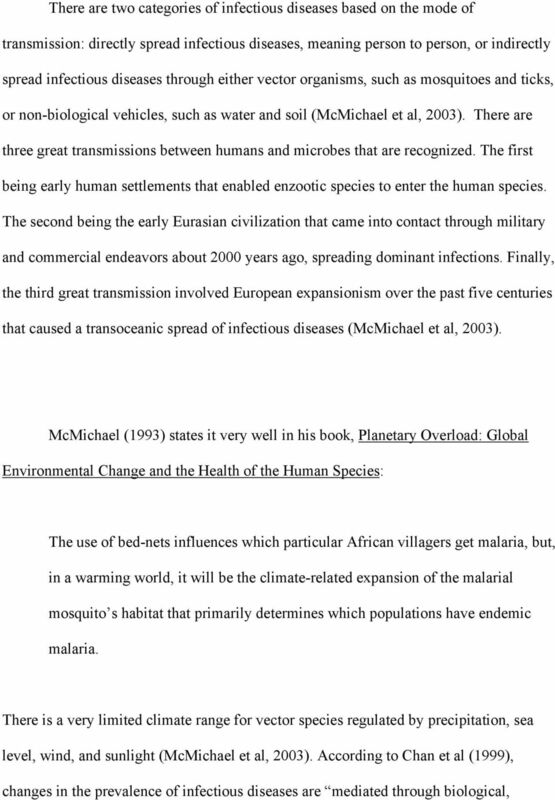 In fact, the word malaria comes from European colonists who settled in the highlands of Africa in the 19 th century fleeing from lowlands that were known as mal arias (Epstein, 2001). 2.2 Disease Determinants There is a wide disparity between the developing world and the developed world in regards to the incidence of diseases; forty percent of the population in the developing world and only two percent of the developed world is infected with at least one infectious disease (Chan et al, 1999). This disparity between the developing and developed world is mainly due to socioeconomic conditions though the gap might become narrower with climate change (Chan et al, 1999). However, developed countries are able to afford public health programs to protect themselves from an epidemic. 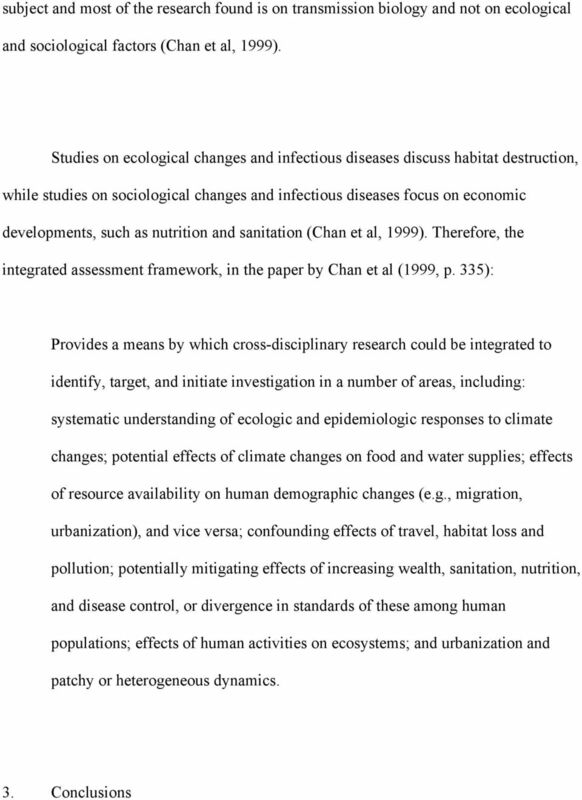 There are a massive amount of disease determinants that are ever changing due to the complexity of many indirect feedback interactions or mechanisms on climate change (Chan et al, 1999, p. 330). For example, one can improve socioeconomic levels, by reducing the breeding sites for mosquitoes, but this can also cause deforestation and in turn an increase in the contact between humans and mosquitoes (Chan et al, 1999). 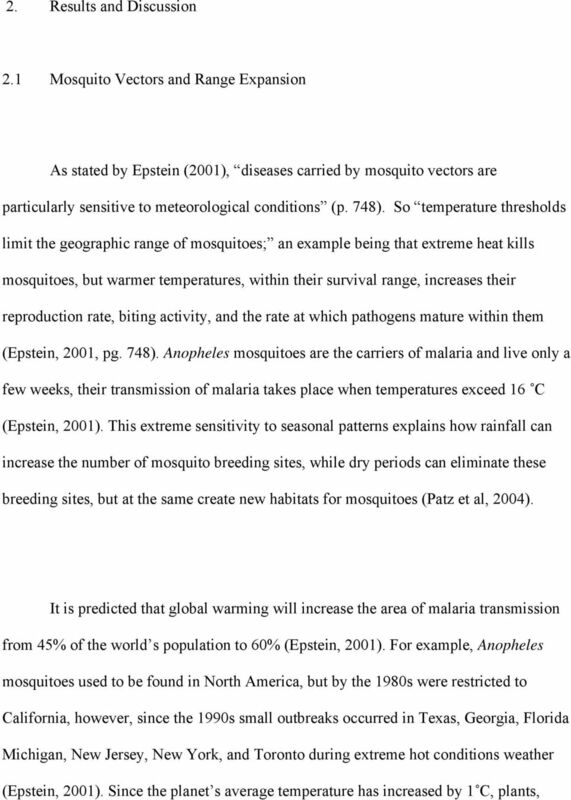 Also higher temperatures could increase or reduce the survival rate of mosquitoes; it all depends on their ecology behavior, and many other factors (Patz et al, 2004). 11 Climate change is occurring and is impacting ecological, biological, epidemiological, and sociological systems that human life depends on, but the degree of this impact is not known because the variables are interrelated and numerous (Patz et al, 2004). There is also a huge dependence on a strong public health system to adapt to the changing risks of vector-borne diseases (Patz et al, 2004). It makes sense then that developing countries with a poor public health system are at a higher risk to health problems that are intensified by climate change; this was also found to be the case within poor populations in the United States (Patz et al, 2004). Consequently a dialogue must take place between developing and developed countries with regards to climate change and its impacts on health risks. The evidence that global warming is an existing force is mounting for the overall trends in regards to glaciers, plants, insects, and temperatures is pointing in one direction and that is a reduction of glaciers, an increase in overall temperatures, and a range expansion of insects and plants (Epstein et al, 1998). Epstein et al (1998, p.415) says it most succinctly: Human activities are altering atmospheric chemistry and changing the earth s heat budget. Together, these chemical and physical changes compounded by largescale land use and land-cover changes have begun to affect biological systems. 12 The public and policy makers must be increasingly concerned with the biological consequences and societal costs associated with climate change. 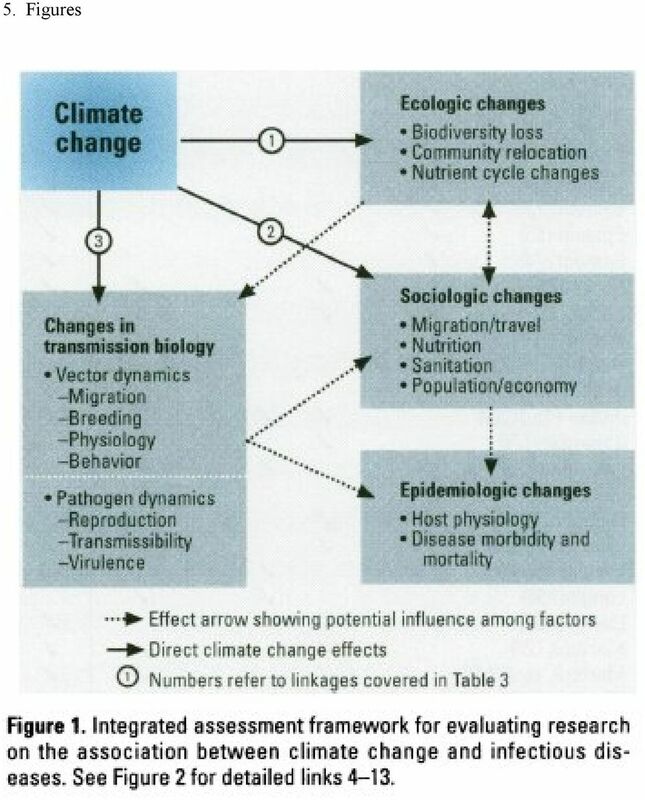 The key to combating the issue of climate change and infectious diseases is to recognize the circular connections between the vector and the biological, ecological, epidemiological, and sociological changes. The multiple disease determinants stress an approach that is multi-faceted and supported by both the developed and developing world. 13 4. 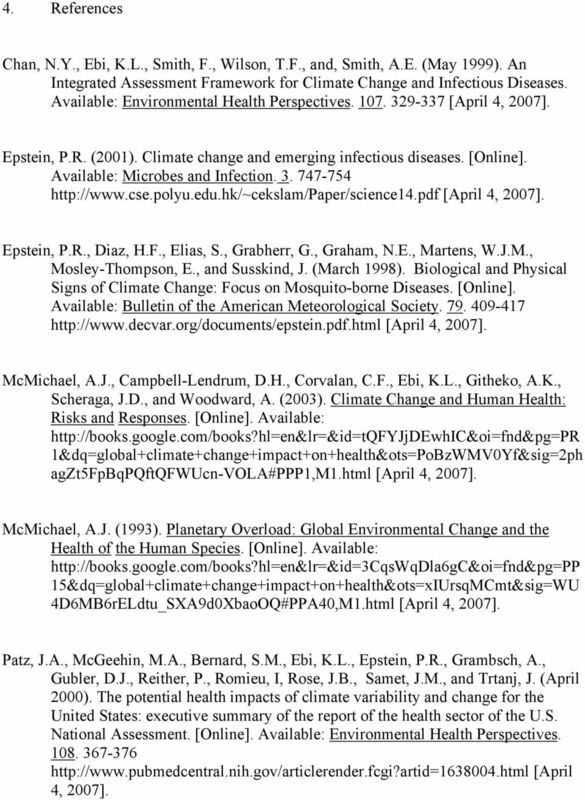 References Chan, N.Y., Ebi, K.L., Smith, F., Wilson, T.F., and, Smith, A.E. (May 1999). 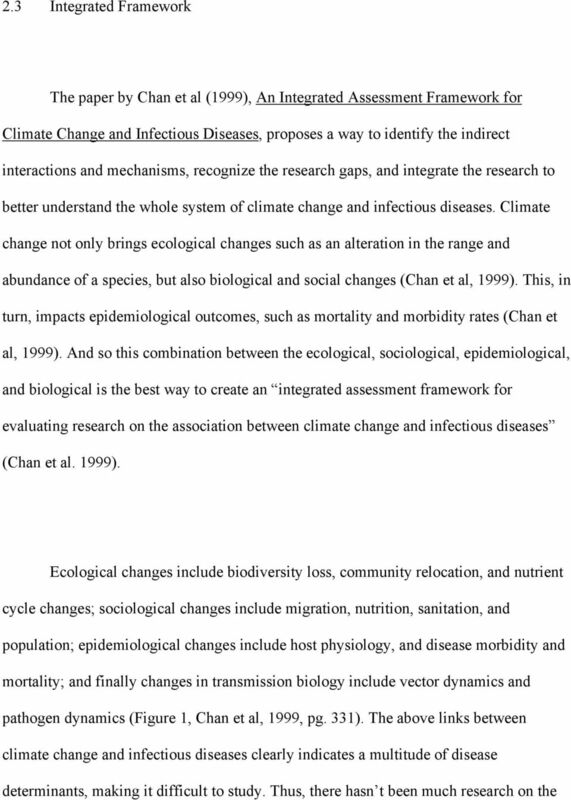 An Integrated Assessment Framework for Climate Change and Infectious Diseases. Available: Environmental Health Perspectives [April 4, 2007]. Epstein, P.R. (2001). Climate change and emerging infectious diseases. [Online]. Available: Microbes and Infection [April 4, 2007]. Epstein, P.R., Diaz, H.F., Elias, S., Grabherr, G., Graham, N.E., Martens, W.J.M., Mosley-Thompson, E., and Susskind, J. (March 1998). Biological and Physical Signs of Climate Change: Focus on Mosquito-borne Diseases. [Online]. Available: Bulletin of the American Meteorological Society [April 4, 2007]. McMichael, A.J., Campbell-Lendrum, D.H., Corvalan, C.F., Ebi, K.L., Githeko, A.K., Scheraga, J.D., and Woodward, A. (2003). Climate Change and Human Health: Risks and Responses. [Online]. Available: 1&dq=global+climate+change+impact+on+health&ots=PoBzWMV0Yf&sig=2ph agzt5fpbqpqftqfwucn-vola#ppp1,m1.html [April 4, 2007]. McMichael, A.J. (1993). Planetary Overload: Global Environmental Change and the Health of the Human Species. [Online]. Available: 15&dq=global+climate+change+impact+on+health&ots=xIUrsqMCmt&sig=WU 4D6MB6rELdtu_SXA9d0XbaoOQ#PPA40,M1.html [April 4, 2007]. Patz, J.A., McGeehin, M.A., Bernard, S.M., Ebi, K.L., Epstein, P.R., Grambsch, A., Gubler, D.J., Reither, P., Romieu, I, Rose, J.B., Samet, J.M., and Trtanj, J. (April 2000). The potential health impacts of climate variability and change for the United States: executive summary of the report of the health sector of the U.S. National Assessment. [Online]. Available: Environmental Health Perspectives [April 4, 2007]. 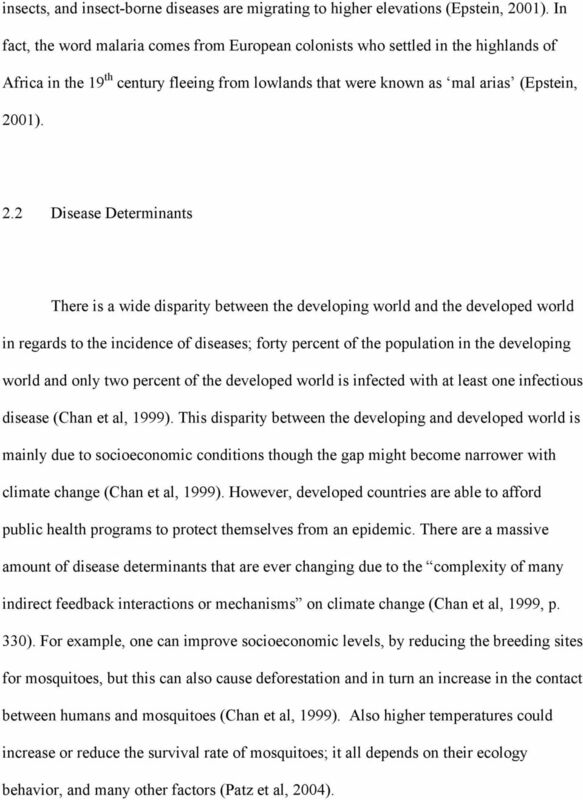 Principles of Disease and Epidemiology. Copyright 2010 Pearson Education, Inc. Weather and climate. reflect. what do you think? look out! The atmosphere has a number of gases, often in tiny amounts, which trap the heat given out by the Earth. climate science A SHORT GUIDE TO This is a short summary of a detailed discussion of climate change science. CONFEDERATION OF ASIA-PACIFIC CHAMBERS OF COMMERCE AND INDUSTRY (CACCI) Policy Paper on Flexible Responses to Environmental Uncertainty and Infrastructure Resolved as of 3 rd October,. A. BACKGROUND 1. SECTION 3.2 CLIMATE AND PRECIPITATION Ulster County Climate Data A preliminary analysis of the Preserve s weather data shows that the average temperature has risen about two degrees over the past 114 years. PRUEBAS DE ACCESO A LA UNIVERSIDAD L.O.G.S.E. / L.O.C.E. A cool CAP post-2013: What measures could help adapt Cyprus farming and biodiversity to the consequences of climate change? Will climate changedisturbance. interactions perturb northern Rocky Mountain ecosystems past the point of no return?